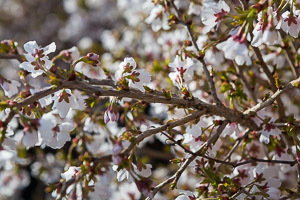 This is a really exciting time of year as new plants start to emerge and gardens really come alive. Every day seems to bring something new to admire. These are just some of the plants I really recommend for flowers at this time of year. It may be a bit of a mouthful but don’t let that put you off! Omphalodes cappadocica ‘Cherry Ingram’ is a diminutive, easy, long-flowering plant with flowers an intense shade of blue which appear in April and May. It’s only about 10cm high but will spread to about 45-50cm in time. There’s a variety called ‘Starry Eyes’ with flowers which have a pale lilac edging, but I prefer the simplicity of ‘Cherry Ingram’. I also particularly like the pointed leaves which are a lovely bright, fresh green. 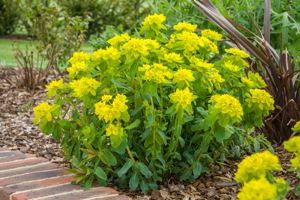 Omphalodes (or ‘Navelwort’) is a perennial which enjoys partial shade, making it an ideal carpeting plant to position under shrubs or in a woodland setting (just make sure the soil doesn’t get too dry). This is definitely one of my all-time favourite plants as it’s just downright beautiful! 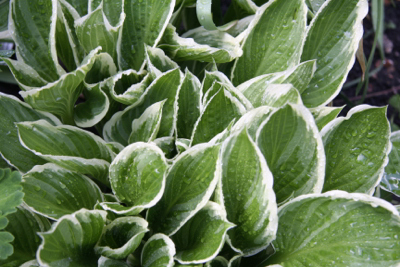 The attractive foliage is a lovely fresh green, and the pure white locket-shaped flowers on arching stems are so pretty! 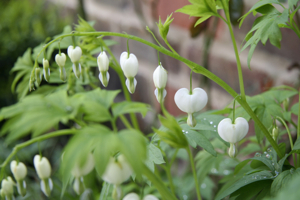 It’s great for shade and partial shade (being naturally found on woodland edges), and although it will do better with reasonably moist soil, it will also cope in drier parts of the garden if enough shade is provided. 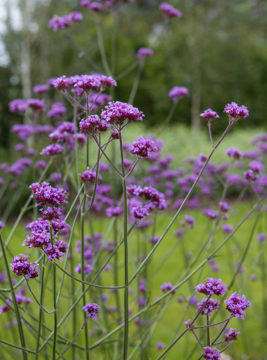 It will also grow well in sunnier areas if the soil is moist enough. 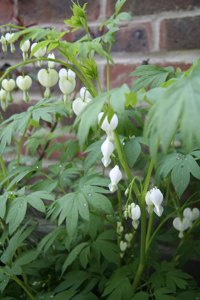 Dicentras (or ‘bleeding hearts’) normally start flowering in April (subject to some decent weather of course) but they do have quite a long flowering period so are usually still going strong in May. 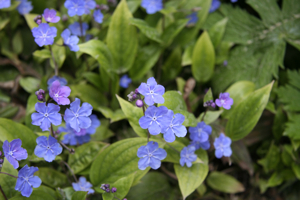 Like Omphalodes, they look fantastic with ferns, bluebells, spring bulbs and emerging Hostas. I have to admit I try to fit them into every garden where the soil conditions are suitable! 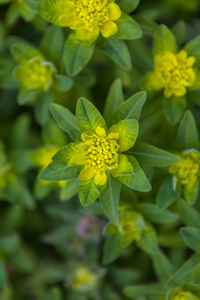 I’m a recent convert to Euphorbia polychroma, having been a fan of the shrubbier Euphorbias (E.characias and E. Mellifera) and the woodland spurge Euphorbia amygdaloides Robbiae for years. 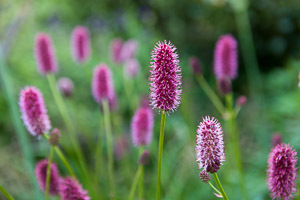 They are so valuable to bring a real splash of early colour to the garden. Euphorbia Polychroma though is quite a different plant as it’s a very neat dome-shaped perennial with bright (and I mean bright!) acid yellow-green flowers at this time of year. It’s a fairly small plant, about 50cm x 50cm, and is very easy to grow in most soils (as long as they drain well) in sun (preferably) or some shade. Like all the best plants, this Euphorbia also dies back nicely turning a sort of coral colour in autumn and gently fading away. One of those ‘must-have’ plants if you have a fairly sunny spot and good drainage. Salvia ‘Mainacht’ (or ‘May Night’) is a compact herbaceous perennial with branched spikes of deep purple flowers which last for a long period generally starting in late May. Unlike some Salvias, this is a hardy variety (happy on sandy soil, loam or chalk). It’s not fussy about soil pH and it’s also attractive to bees & butterflies so it’s great to include in planting schemes to attract wildlife. 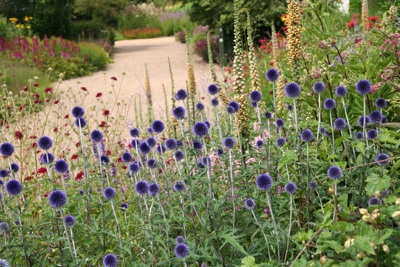 Salvia ‘Mainacht’ (also known as Salvia ‘May Night’) will grow to about 60cm high and has a spread of about 45cm. 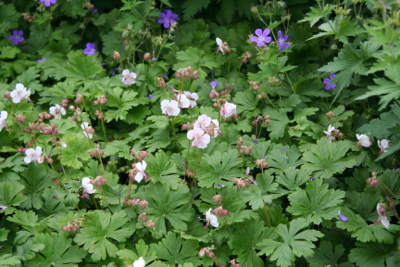 It looks great with cottage garden plants such as Geraniums, Nepeta and Alchemilla Mollis.